MA Tapestry. Sizes 24-26 Tapestry  - $2.44 : Yarn Tree, Your wholesale source for cross stitch supplies. 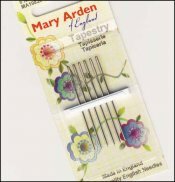 Sizes 24 and 26 (3 each) Mary Arden Tapestry Needles. 6 needles per card. Perfect for counted cross stitch and needlepoint, tapestry needles have a long, thin eye and a dull point. 1¾” long. The larger the number, the smaller the needle (ie: size 28 is smaller than size 20). 6 cards per box. Please order by the number of cards.